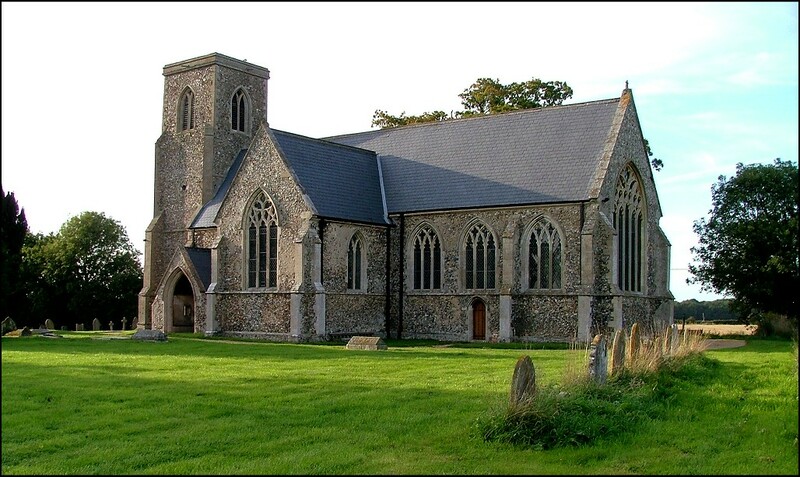 From a map, you might think that Besthorpe is a suburb of Attleborough, but thanks to the sleight of hand of local authority planning rules you find All Saints out in the fields, along narrow dog-legging lanes. In fact, the parish extends beyond the A11 to include large areas of housing which must look towards Attleborough rather than to here. All Saints is a big church, a grand cruciform church, with a crispness that marks the 19th century restoration by JB Pearce and the massive new roof of the 1980s. In fact, all else that you see is pretty much all a complete church of the early 14th century; only the great east window is by Pearce, probably an attempt to make it more Decorated than it already was. Because of the positioning of the transepts, the chancel appears longer than the nave, but when you go inside a sense of balance is restored. This is an obviously very well-kept and well-used building, for which the parish are to be congratulated. 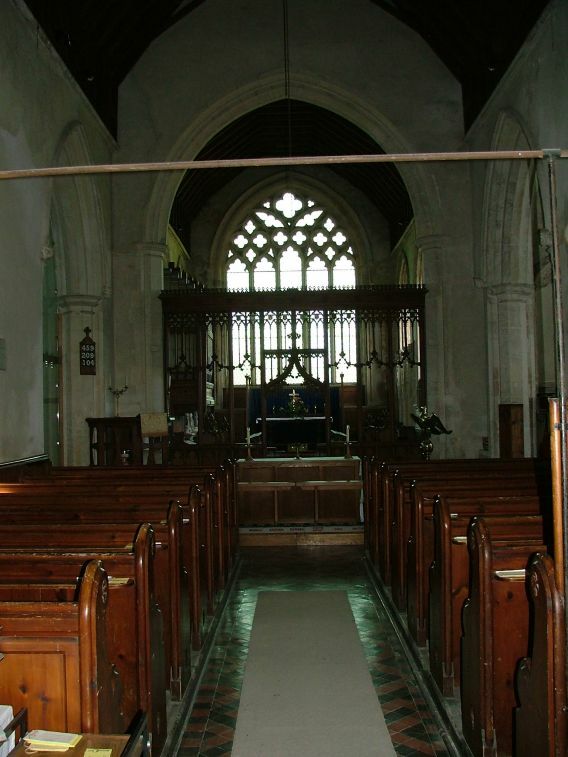 The nave itself is rather unexciting, and of course there is no central crossing, but rather the more familiar tripartite separation with a chancel arch at the east end and a tower arch at the west. 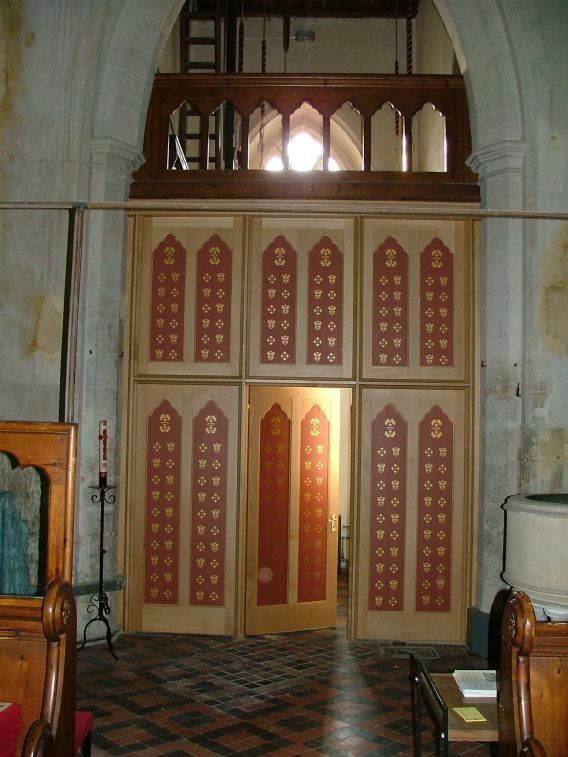 The tower arch has a modern, painted screen, which is very effective. The heavy furnishings and gloomy windows make the nave rather dark, but there is a pleasant surprise as you head eastwards. The two transepts are both full of light. 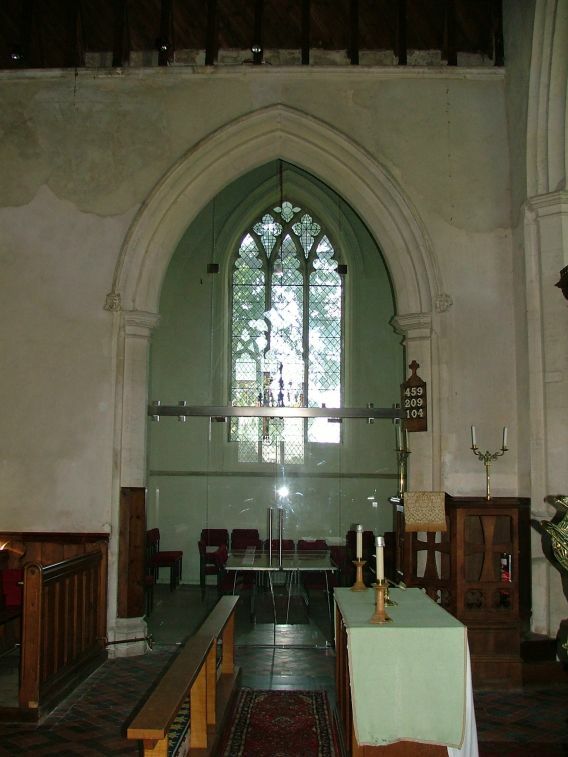 The north transept has recently been converted into a meeting room, with a glass screen. I understand that the parish did not get much change out of £100,000, so it is a quality piece of conversion. The central nave altar on its podium is rather solid, but the 1930s screen behind is light and airy, and the light increases as you step through it into the chancel, which is really rather elegant. 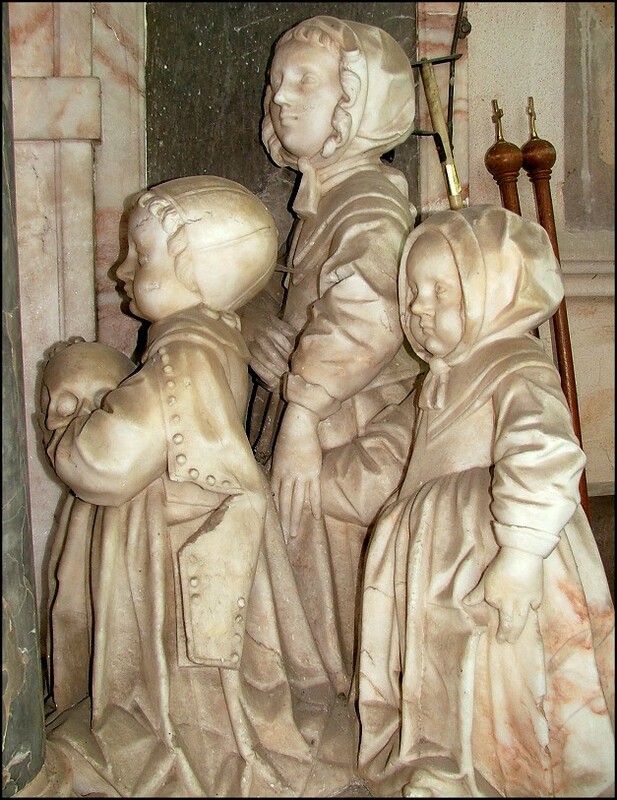 It is also home to one of Norfolk's most characterful and singular memorials, made by the Christmas brothers for Sir William Drury, who died in 1639. 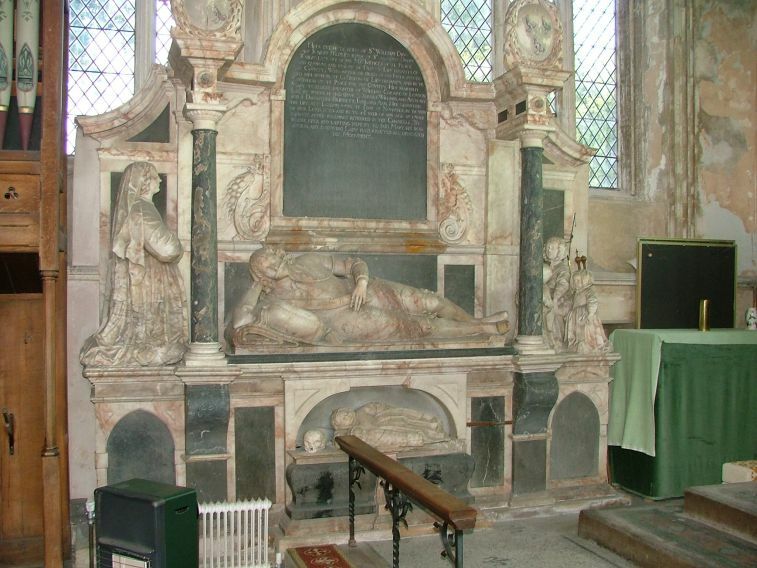 He reclines stoically, looking rather like his cousins across the border in Hawstead. What makes the memorial extraordinary is the other figures, who enter stage left and right as if this was a tableau performance. 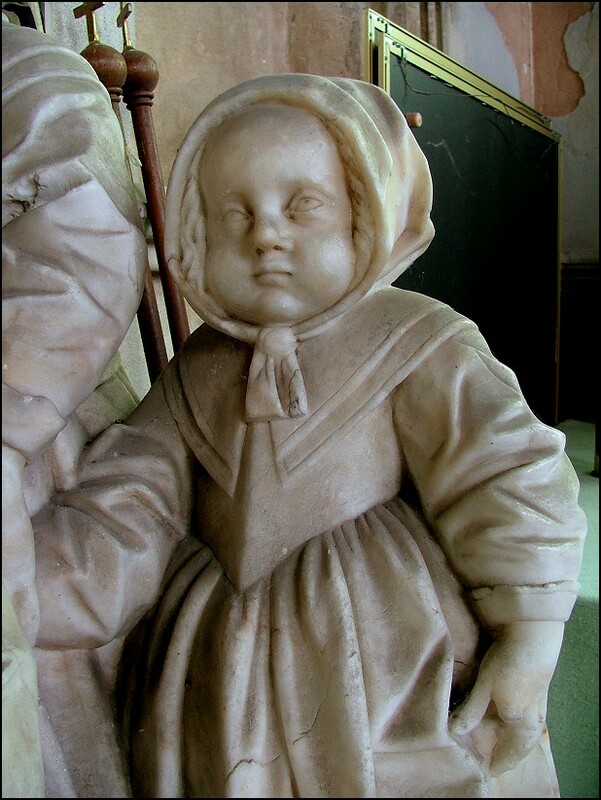 Most striking of all are the three children on the eastern side, who shuffle mournfully into view, the boy carrying a skull as if it was a football. On the right, his wife is rigid at prayer, but below is a note of horror, two corpses of children, one in a winding cloth, and another skull. Coming back westwards, the south transept contains Besthorpe's greatest treasure. 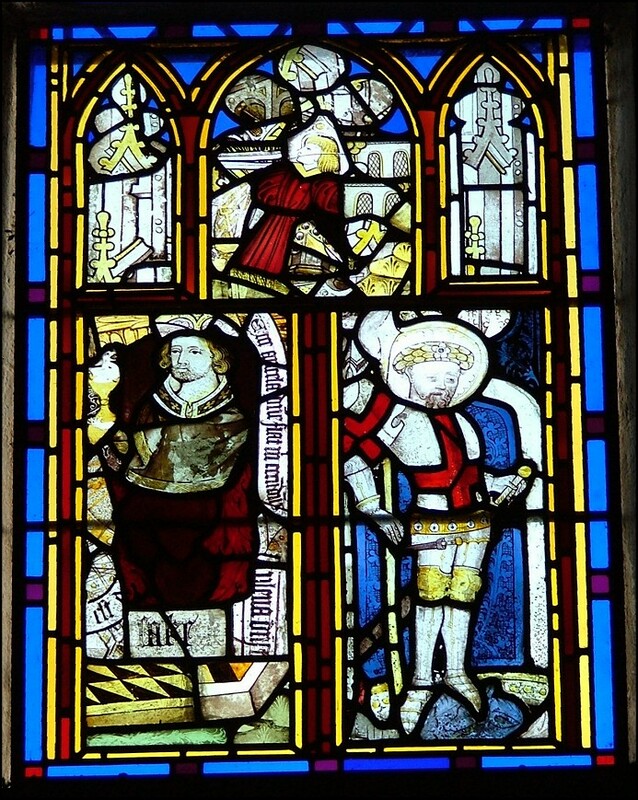 This is the collection of 15th century Norfolk School glass, which has been reset in four large rectangular panels and suspended in front of the south window rather than glazed into it. 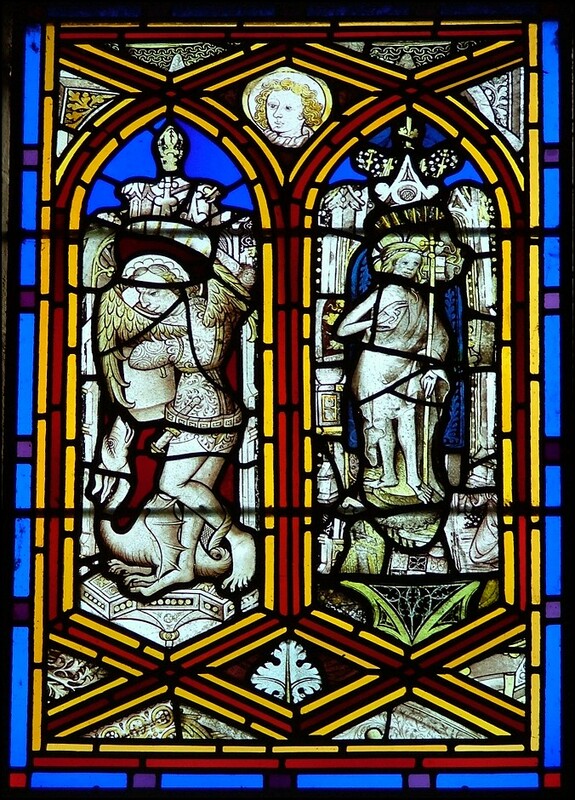 This is very successfully done, I think, and protects the glass well from both pollution and vandalism; particularly the former, which causes far more damage to medieval glass than the second. There are some relatively complete figures, the best of which are St Michael and St George dispatching their dragons. 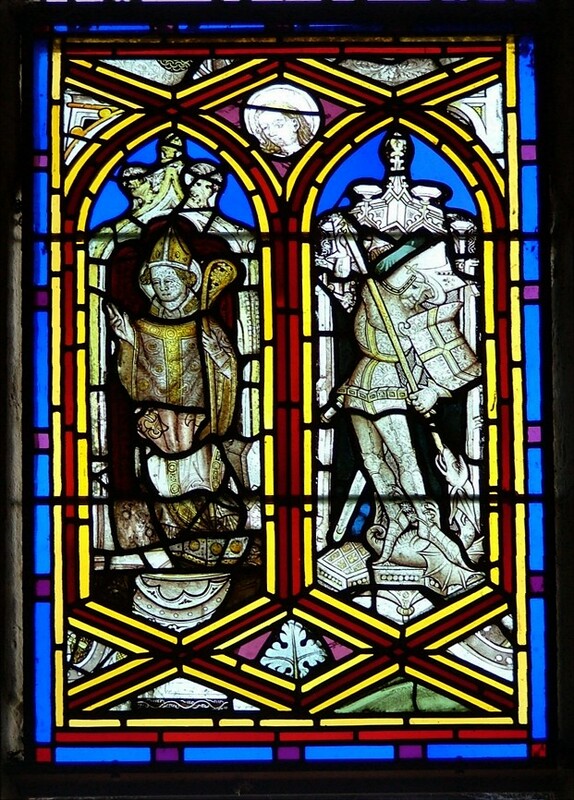 St George is paired with a Bishop, and there is a face of a Norwich angel in a roundel above them. St Michael is paired with an image of the Resurrected Christ as the Lamb of God, with another angel face above. There is a second St George with a beturbaned head, which may be a restorer's fancy. 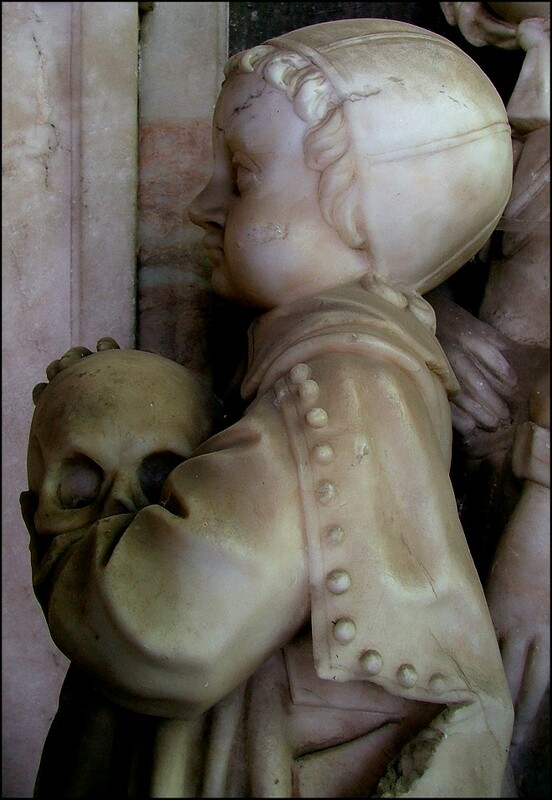 He is paired with a composite figure which holds the poisoned chalice of St John the Divine. 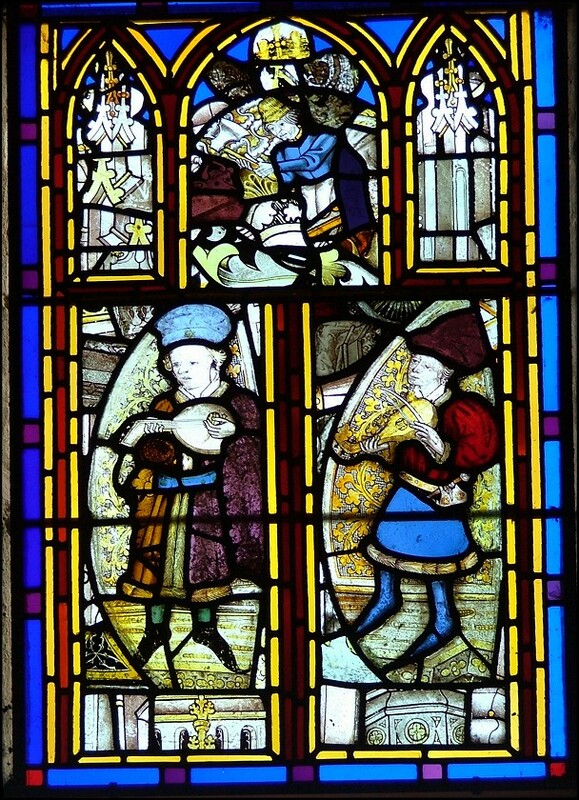 Above them is a kneeling figure who may have been a donor. 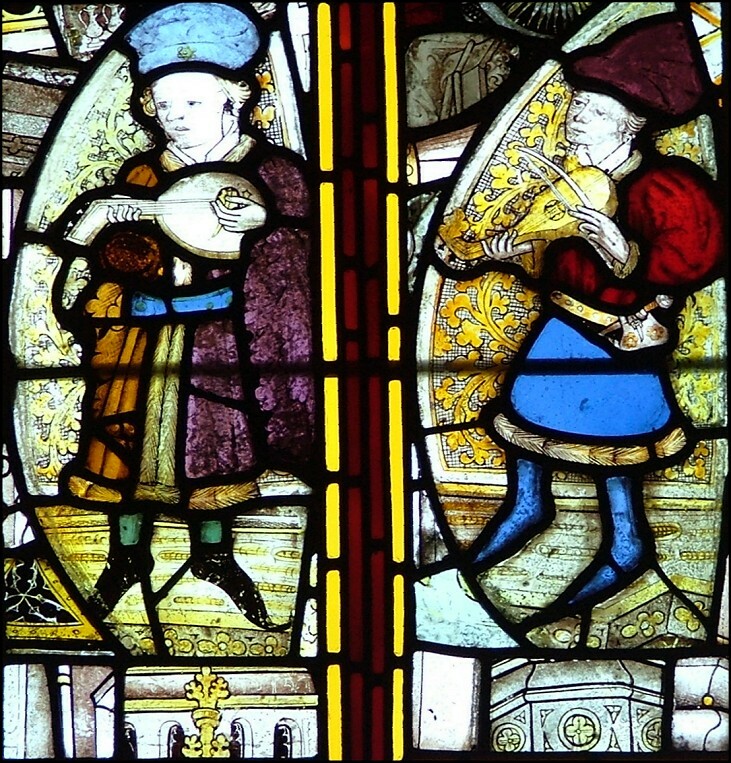 In another panel, two musicians stand on hauntingly beautiful floors of Norwich School barleycorns, while above in a roundel is a man carrying an axe, almost certainly from a sequence of the Labours of the Months. He probably represents either November or December, either slaughtering a pig or collecting wood. It is is a wonderful collection, worth coming a long way to see. 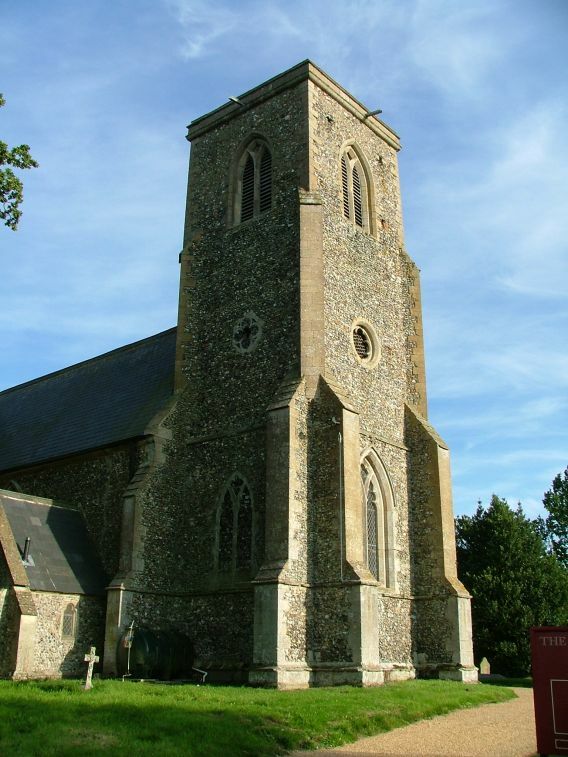 The great triumph of the Church of England in the last century or so is the extent to which it has safeguarded the larger part of the nation's heritage. 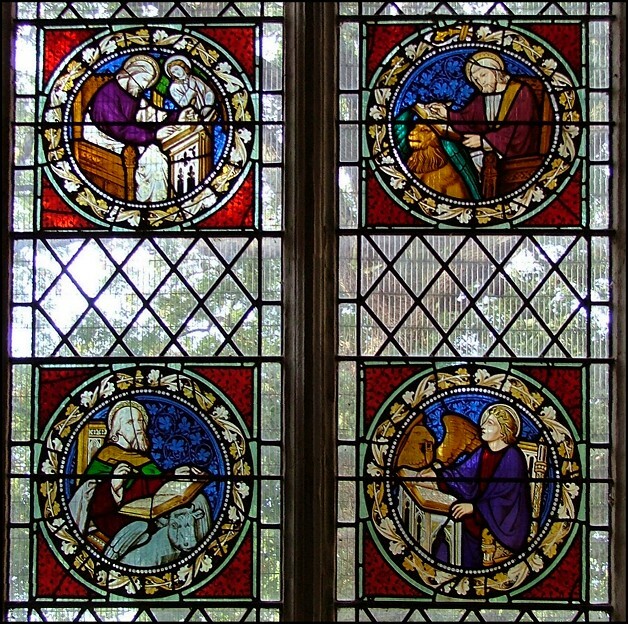 If these glass panels had disappeared into museums, it would have been a grievous loss. But apart from these wonderful survivals, this is essentially a 19th century interior. 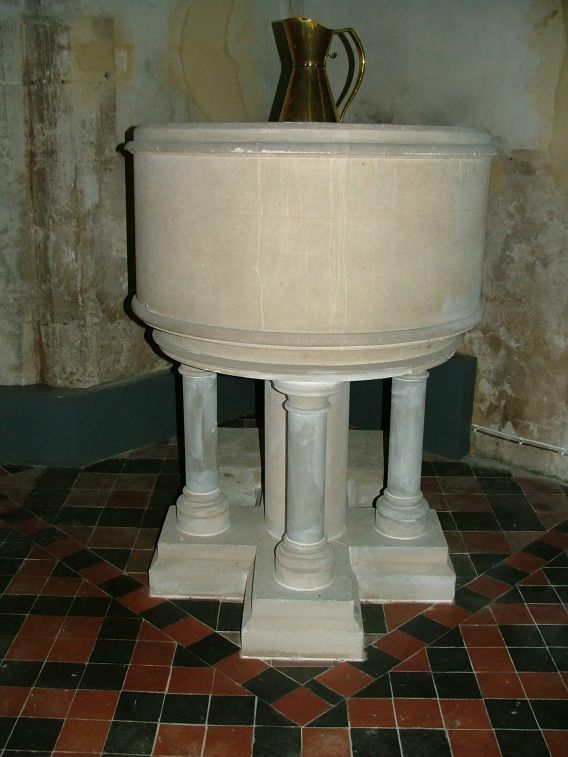 There are lots of fairly dour floor tiles, and the font is a most curious mock-Norman drum on pillars. 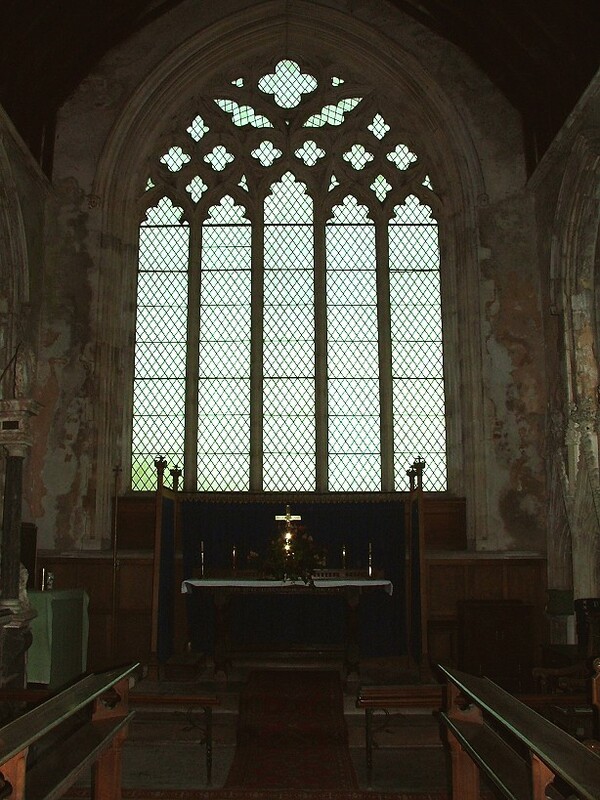 There is a fine set of four Evangelists in coloured glass, and although the walls are suffering from damp and discoloration, this is in hand, and redecoration is the next project for which the parish is saving up. Of course, it is insane that they should have to find the funding for it; in most European countries, it would be the responsiblity of the State, and everyone would be glad to know that the money was coming out of central taxation. But that is not the case here. 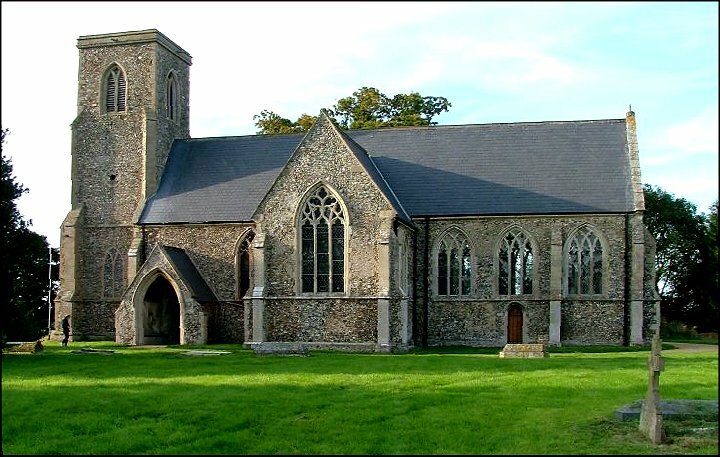 In the United Kingdom, we still find ourselves in the situation where shrinking congregations are needing to shell out increasingly large amounts of money for the upkeep of buildings that, because of funding shortfalls, are themselves increasingly in need of repair. It is an unsustainable spiral. Where will we be in thirty years time?